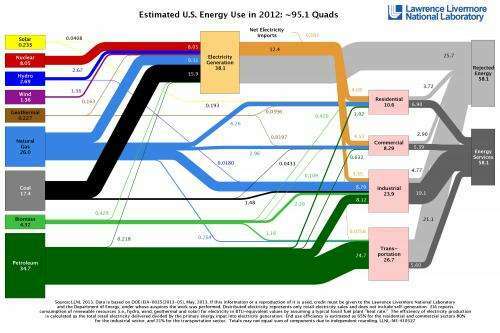 The 2012 energy flow chart released by Lawrence Livermore National Laboratory details the sources of energy production, how Americans are using energy and how much waste exists. Each year, the Laboratory releases energy flow charts that track the nation's consumption of energy resources. Overall, Americans used 2.2 quadrillion BTU, or quads, less in 2012 than the previous year. (BTU or British Thermal Unit is a unit of measurement for energy; 3,400 BTU is equivalent to about 1 kW-hr). Once again, wind power saw the highest percentage gains in going from 1.17 quads produced in 2011 up to 1.36 quads in 2012. New wind farms continue to come on line with bigger, more efficient turbines that have been developed in response to government-sponsored incentives to invest in renewable energy.